Seasonal changes can wreak havoc on our most delicate, and often most-ignored organ—our skin. There are many factors influencing how our skin behaves, so it’s important to pay attention to how your skin reacts to climate, stress, and what you put onto and into your body. 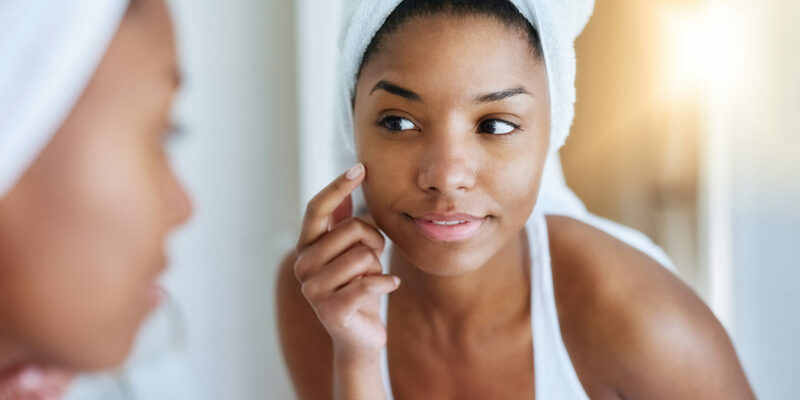 Creating harmony with your skin can be tricky and frustrating, so here are some simple skin care tips that have helped me in my quest for beautiful, healthy skin. Know the difference between dehydration and dryness. Dehydration is lack of water, while dryness is the absence of oil. Our oil glands don’t know the difference. All they can detect is tightness due to a moisture problem, which causes them to kick into overdrive to compensate. Consult with a well-seasoned aesthetician to properly assess your skin, so you aren’t making an issue worse. Finding an aesthetician who can educate you is a great first step in combating winter skin blues. For oily skin that lacks water, you want ingredients such as hyaluronic acid, along with oil-free hydrators to apply in the morning and evening. If you have skin that lacks oil, you’ll find comfort in high-quality oils such as extra virgin and cold-pressed coconut oil. Always remove makeup before sleep. Leftover makeup and debris can lead to bacteria build up and cause moisture problems. This is one of the main reasons acne rears its ugly head. Use a treatment toner after proper cleansing. This vital step will continue the cleansing process by removing anything left behind. It will also keep your skin’s cell receptors open so products absorb properly. Your skin should still be moist from your toner before applying products, just as your body should be damp from the shower when you apply lotion. Treatment toners should have glycolic, salicylic, or lactic acids to help gently get rid of dead skin while creating the best environment for your serums and creams. I find this very simple step helps create a team of nutrients and hydration that will withstand the rigors of your day. Serums come in three bases: liquids, gels, and creams. It’s a good rule of thumb to layer in the above order to allow them to work optimally. Here are a few of my favorite serums. Hyaluronic acid is very hydrating and tends to be a liquid serum. HGF (human growth factors), are gel or cream bases and are excellent for wrinkles and skin tightening. Vitamin C (L-Ascorbic acid) usually arrives in a liquid or cream formulation and fights inflammation, carcinogenic activity, and free radicals. Remember, it’s not only what you apply to your skin that makes it healthy, it’s also how you apply it. Naturally exfoliate with the proper tools. Removing dead skin using manual exfoliation can be one of the best ways to ensure proper product absorption. Dead skin cells can cause dullness and moisture retention issues and can make your complexion look older than it is. I recommend an electric or battery powered facial brush that cleanses with ultrasonic technology and is wireless so it can be used in the shower. I don’t recommend “scratchy granules,” which can cause microscopic cuts in the skin. Manual grains are a dated way of removing dead skin and can cause a breeding ground for bacteria and acne eruptions. Also, inexpensive brushes that rotate 360 degrees with no vibration are not ideal. Because they require extra pressure to work, they pull your delicate facial tissue in an unhealthy manner. Invest in monthly professional facial peels and follow expert, customized advice. When performed properly, professional peels will create a beautiful, smooth finish allowing your natural complexion to reflect light the proper way. Changing the way your skin functions on a deeper level will encourage natural moisture to come to the surface, therefore giving you less reason to apply moisturizers. Applying heavy creams to unhealthy, dead skin will keep you on a vicious cycle that can get can progressively worse if you don’t have a plan of action, customized just for you. Drink pure spring or mineral water that is free of fluoride, chlorine and harmful chemicals. Start drinking water when you wake up. Aside from being one of the best things for your skin’s hydration, it will also help with digestion and flushing out toxins. It also helps me make better breakfast decisions because I’m not as hungry. You will be amazed at how long water can keep you feeling full. For a full consultation or more information on skincare, visit Plastic Surgery Associates of New Jersey.